Say Hello, Wave Goodbye, To Come On Gang!… | Scots Whay Hae! It’s the very definition of the ‘good news, bad news’ scenario. The excellent Come On Gang! 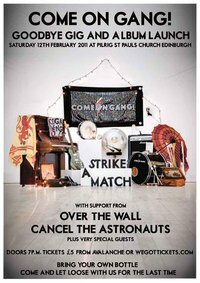 release their album Strike A Match tomorrow night with a gig at Pilrig St Paul’s Church, Leith Walk, Edinburgh. The bad news is that this is also going to be their farewell as the band have decided to call it a day. They are/were one of the only bands in the current Scottish music scene who embraced the aesthetic of pop music with open arms. In a similar way to Dogs Die in Hot Cars, BMX Bandits, the sadly missed Adventures In Stereo, and anything Davie Henderson is involved in, they have a way with a hook that few can match. You think it’s easy? Try it yourself. They are supported by Cancel the Astronauts and Over the Wall, and I believe there is the promise of a DJ battle (and you can take that literally) between Aye Tunes and Peenko. It’s bound to be a cracking night, and if anyone deserves a right good send off it’s Come On Gang! It’s a fiver to get in, and BYOB, so if you are at a loose end tomorrow night and find yourself down Leith way I suggest it would be rude not to head along. All the best in your future endeavours. I’d love to know what they are.